Emulsifies -Picks up grease, oils and soils and holds them in suspension so they can be easily rinsed away. 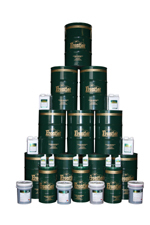 Multi purpose – Cleans all surfaces, safe to use on ferrous and non ferrous metals. Circulate, soak, spray or wipe on and rinse off thoroughly. For best results in cleaning vats, 12 hours of mild heat and agitation followed by pressure rinse is recommended. General Purpose: For cleaning of dirt and grease from walls, floors, equipment, lift trucks, engines, pipes, electric motors, machinery and ink from printers and presses use one part All Clean Extra to five parts of water (1:5). Industrial: For oil rigs, engines, oilside of heat exchangers, pipes, conveyers, exhaust soot and stains, machines, metal stock, welding equipment and oil soaked or greasy floors use one part All Clean Extrato two parts of water (1:2). Aqueous Cleaning Vats: For cleaning oily, greasy and carboned parts use one part All Clean Extrato one part of water (1:1). Contains: Alkaline silicates. May be harmful if swallowed. Can cause eye and skin irritation. External: Flood with water and wash with vinegar. Internal: Give lemon, grapefruit or orange juice freely, follow with olive oil. Eyes: Wash with 5-6% boric acid solution. If irritation or pain persists, call physician.